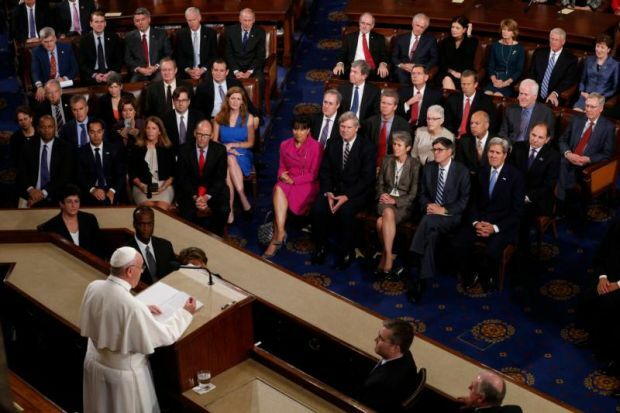 WASHINGTON (CNS) — The past, the promise and the potential of the United States must not be smothered by bickering and even hatred at a time when the U.S. people and indeed the world need a helping hand, Pope Francis told the U.S. Congress. Pope Francis condemned legalized abortion, the death penalty and unscrupulous weapons sales. He called on Congress to “seize the moment” by moving forward with normalizing relations with Cuba. And, again referring to himself as a “son of immigrants” — and pointing out that many of the legislators are, too — he pleaded for greater openness to accepting immigrants. “I would like to take this opportunity to dialogue with the many thousands of men and women who strive each day to do an honest day’s work, to bring home their daily bread, to save money and — one step at a time — to build a better life for their families,” the pope said. Showing he had studied the United States before the visit — something he said he would do during the Rome August break — he used four iconic U.S. citizens as relevant models of virtue for Americans today: Abraham Lincoln, the Rev. Martin Luther King Jr., Dorothy Day and Thomas Merton. 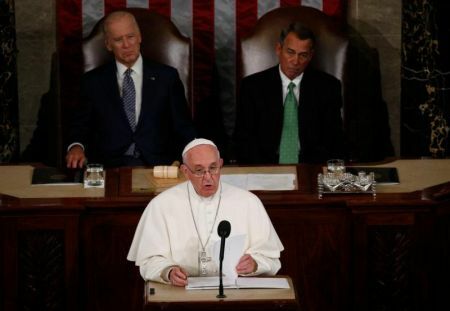 Describing political service with the same tone used to describe a vocation to religious life — “you have been invited, called and convened by those who elected you” — the pope recognized the weighty responsibility of being a member of the U.S. Congress. Tens thousands of people watched the speech on giant screen from the Capitol’s West Lawn. Gathered hours before the pope’s morning visit, they were entertained by military bands. His speech to Congress included more of that teaching, delving deeper into the positive aspects of a market economy — as long as it is ethical and includes controls, solidarity and a safety net for the poorest and weakest members of society. Pope Francis is much more Concern about capital punishment, which has never been condemned by the church, than abortion. This pope will only promote a secualr and liberal agenda.